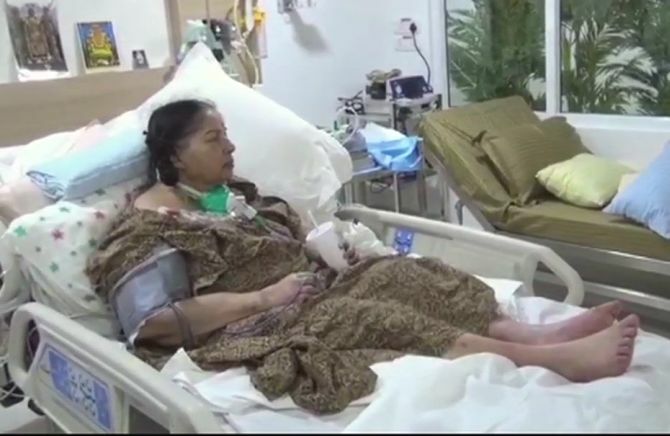 Setting off a political controversy a day ahead of RK Nagar bypoll, a video purportedly showing late Chief Minister J Jayalalithaa in a hospital was released by sidelined All India Anna Dravida Munnetra Kazhagam leader TTV Dinakaran's loyalist on Wednesday. Amid questions raised about timing of the about 20 second video, aired by TV channels and later went viral on the social media, election officials asked channels to stop it's telecast, saying it was a violation of the model code of conduct. The footage, showing a frail looking AIADMK supremo in a nightdress and sipping what appeared to be a health drink with a straw, was released by Vetrivel, disqualified AIADMK MLA and election agent of Dinakaran, contesting the bypoll as an independent. Meanwhile, the one man commission probing the circumstances leading to hospitalisation and medical treatment provided to Jayalalithaa till her death last year has filed a police complaint against Vetrivel. According to a police official, a complaint has been received from the Justice A Arumughaswamy Commission "seeking action against Vetrivel" even as the Commission has started the inquiry as per its terms of reference. The official declined to divulge details of the complaint. The commission reportedly alleged that Vetrivel had intentionally released the purported video to "degrade" it and to create law and order problems. The AIADMK hit out at Sasikala's family, saying the video release was a "conspiracy" and a "demeaning" act with an eye on Thursday's bypoll, considered an acid test for the ruling dispensation, being the first poll after Jayalalithaa's demise. Suspicions have been raised over circumstances leading to Jayalalithaa's demise by several persons, including now deputy chief minister O Panneerselvam and his followers. The state government has appointed a retired Madras high court judge as the one-man commission of inquiry to look into the circumstances leading to her death. The Dravida Munnetra Kazhagam, which raised the issue of doubts over Jayalalithaa's death during the campaign, and several others alleged that the video had been released with an eye on the bypoll. Defending the release of the video, Vetrivel said he did it on his own "out of mental agony. Later Dinakaran called me and asked me why I did so," he said. Tamil Nadu Chief Electoral Officer Rajesh Lakhoni told reporters that TV channels were asked to immediately stop airing the clip, which they duly complied with. He said telecast or display of any election-related material 48 hours before conclusion of the poll was barred under election laws. Returning Officer Praveen Nair, in his complaint said the video release violated the model code and the Representation of the People's Act. "Neither the candidate nor his election agent obtained any permission from the Media Certification Monitoring Committee, which is also a violation of the Code," he said. The high stakes bypoll is being held to fill the vacancy caused by the death of sitting MLA Jayalalithaa on December 5 last year. She was admitted to Apollo Hospital in Chennai on September 22 last year after she complained of fever and dehydration. She died of cardiac arrest after 75 days in the hospital. There was no response from Apollo Hospital to a query on the veracity of the video, which showed Jayalalithaa sipping the drink with a straw from a use-and-throw glass topped with a lid. On her bedside was the portrait of a deity. The ruling AIADMK, which has sidelined the Sasikala family, said the video release amounted to bringing "disrepute" to the late chief minister's fame and image. "This demeaning (act) is a planned conspiracy by the Sasikala family to bring disrepute to Amma's fame and image, done keeping in mind the (RK Nagar) bypoll," said senior AIADMK leader and Fisheries Minister D Jayakumar. AIADMK supporters and the people would not accept this, he told reporters. He also asked why they did not approach the inquiry commission probing the death of the AIADMK supremo. In a Facebook post, he said the clip was released at a time when RK Nagar people were set to vote. "To tackle their party (AIADMK) problem and to divert people, the video has been released with an ulterior motive.. They have come forward to make Jayalalithaa a scapegoat even after her death...as usual," he charged. Stating that the video would also raise doubts among the public as to how Jayalalithaa died after recuperating so well, he said Chief Minister K Palaniswami and Panneerselvam should answer such suspicions. Sasikala's niece Krishnapriya claimed the video was taken by her aunt at the request of Jayalalithaa herself and it had been released without her (aunt's) nod. Terming it as a "big mistake" and "betrayal of trust" on the part of Vetrivel, she said action should have been taken by now by Dinakaran against him. Krishnapriya is the daughter of Ilavarasi, wife of the brother of Sasikala, who is also serving the prison term along with Sasikala in the disproportionates assets case. "Chinnamma did not release the video to defend her even when she faced many charges.We gave the video to Dinakaran. It was Sasikala who asked us to give it to him for submission to the inquiry commission if needed and not for public display," she said and wondered "why and how" it reached Vetrivel. On the date on which the video was shot, she said it was taken a "month or two" after Jayalalithaa was hospitalised. "First she was in ICU and later she was brought to a room and the video was shot at that time," she claimed.